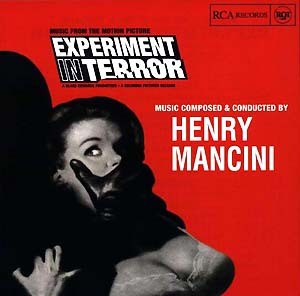 The 155th Soundtrack of the Week is Henry Mancini's Experiment in Terror, one of many collaborations between Mancini and director Blake Edwards. 1962's Experiment in Terror was ahead of its time, anticipating both the sleazy and spectacular thrillers that would come out of Hollywood in the 1970s and '80s but also the giallo films of Mario Bava and other Italian directors. The plot concerns a psycho killer who terrorizes a bank teller so that she'll leave her bank one day with $100,000 in her purse. (Would this have been possible?) If she doesn't cooperate he'll kill her and her younger sister, but not before making them wish they were dead. Lee Remick is the teller and Glenn Ford is the FBI agent who answers her call when she phones the San Francisco branch of the agency. Lucky for her, the entire San Francisco branch seems to have absolutely nothing to do and immediately puts all of its resources and personnel on her case. Glenn Ford is the acme of stolid 1950s-ish American competence. If George Reeves's Superman ran afoul of him, Superman would be in trouble. The movie is genuinely suspenseful and occasionally quite frightening. Ross Martin's performance as the asthmatic psycho killer—another villain with an "otherness"-enhancing affliction—is made exponentially creepier by Philip Lathrop's superb black-and-white photography and Henry Mancini's sickeningly dreadful main theme. This is apparently an album recording and not the original motion picture soundtrack. The original soundtrack makes extremely effective use of the Hammond organ—a single low note, a sound of pure menace, is the true "theme" for the maniac villain. 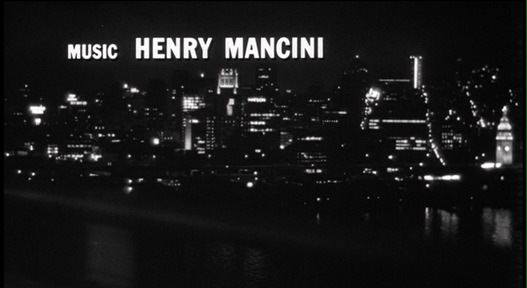 And Mancini fans will appreciate that during the climax of the movie, which takes place at a baseball game, Mancini's theme for Mr. Lucky is played on the ballpark organ. There's very little dramatic underscore in the movie. Realism was the apparent goal of the filmmakers, and so there's an abundance of location shooting and a reliance on source music. The record starts with "Flutter's Ball", an easy listening tune that's heard on a car radio. Well, not just any car radio, but the radio in Lee Remick's Ford Fairlane convertible. This is followed by "Tooty Twist", which I think is blaring from the radio or jukebox at the local teen hang-out spot. (Stefanie Powers plays Lee Remick's teenage sister.) It's similar to some of the music Mancini wrote for Touch of Evil. "Kelly's Tune" is a breezy west coast jazz tune written for Lee Remick's character. It has classic Mancini horn arrangements and features the doublebass. "Golden Gate Twist" is, um, well, I don't remember where this was in the movie. It's cool, though. I like the twist and there's a good guitar solo. "The Good Old Days" is music that accompanies a silent film comedy. The bad guy is always sending Lee Remick off to someplace or other, and on this occasion she has to go to a cinema. Then there's the "Experiment in Terror (Twist)" which I think is heard at the swimming pool where Stefanie Powers and her boyfriend go. It's really great but it's at this point that the sequencing of the album seems to be backwards. Did they get the A and B sides mixed up? This tune would be a great ending for the B side but "Flutter's Ball" is a terrible first tune for the A side. The next tune, though, number seven of twelve, would make the perfect first cut for the A side. 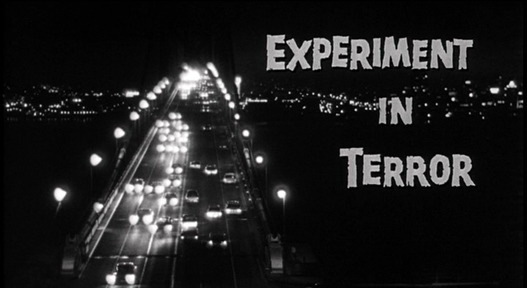 It's "Experiment in Terror", the actual main title. You hear this during the opening credits while Lee Remick is driving her convertible over the Golden Gate Bridge, back to her home in Twin Peaks. Fantastic use of the autoharp, incredible guitar sound, brilliant orchestration throughout. Is it a cymbalom playing the melody? I wish I knew. The liner notes don't offer much information other than that Jimmy Rowles plays piano on the next track, "Nancy". "Nancy" is a very modern-sounding, creepy tune. I don't think anybody would guess that Jimmy Rowles is playing the eerie and unsettling piano part. Here, too, Experiment in Terror seems to be ahead of its time. What you hear would be common enough in a few years, but in 1961 or 1962? "Down by the Wharf" is hurdy-gurdyish music for a scene set at Fisherman's Wharf. "Teen-Age Hostage" is the most active piece on the record, with frantically driving strings and hammering snare drum creating the adrenaline surge Stefanie Powers's character experiences when she thinks her older sister is in trouble. This gives way to the horrifying low note on the organ and a recapitulation of the main theme. You can tell just by listening that she's fallen into the clutches of Ross Martin's monster. "White on White" is a sentimental solo piano piece (Jimmy Rowles again?) and "Final Out at Candelstick Park" brings us to the climax and the brilliant main theme again, this time blending into a more traditional dramatic orchestration.